Jared Burton pitching for the Twins in 2012. On Monday, the Yankees announced that they had signed relief pitcher Jared Burton to a minor-league deal with an invite to spring training. 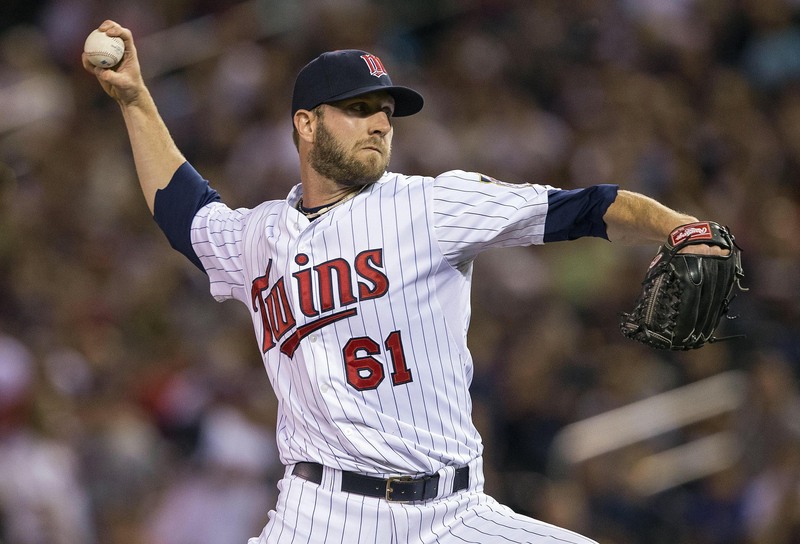 The 33-year-old veteran spent his last three seasons with the Minnesota Twins after pitching his previous five seasons in the Cincinnati Reds organization. Last season he was 3-5 with a 4.36 ERA in 64 innings for the Twins. In 2014, he relied on his change (88mph) and four-seam fastball (93mph), and also mixed in his slider (86mph) and sinker (92mph). He is a fly ball pitcher and his signature pitch is a splitter-changeup that he calls a splangeup. He did not locate his pitches last season like he has in previous seasons as his career ERA is a good bit lower than it was in 2014. In 361 innings as a relief pitcher with the Reds and Twins, he has an 18-19 record, a 3.44 ERA, 305 strikeouts and 136 walks. Burton, who went to Western Carolina University, had his most productive season in 2012. During that campaign as Minnesota’s primary set-up man, he had a career-low 2.18 ERA, 18 holds, 55 strikeouts, a career-low 2.3 walks per nine innings while throwing 62 innings. The Yankees currently have a lot of depth in their bullpen and are basically already set in terms of the relief pitchers who will make the major league roster, which means that Burton will most likely start the season with Triple-A Scranton and be ready in case of an injury. If he pitches the way he did in 2012 during spring training, it is possible that he earns the last spot in the bullpen. However, it doesn’t seem like that will happen since his stats have gotten worse from 2012 to 2013 and from 2013 to 2014. This move makes sense because the Yankees have nothing to lose since they didn’t give up anything, and he could help the Yankees win a few games this season if the regains some of the effectiveness that he previously had.